A hamster who evaded an army of would-be rescuers, including a troop of firemen, while on the run for eight days has returned safe and sound. Fudgie finally crawled from a hole in a kitchen floor into her cage at six-year-old Zoe Appleby's Dunbar home. 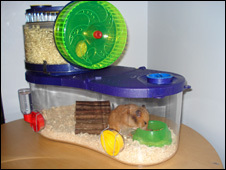 Zoe's mother, Angela Appleby, said it was a great relief because she was only looking after the hamster for a friend. She told the BBC Scotland news website: "When my husband found her, it was like Christmas morning for the children." Computer programmer Derek Appleby discovered Fudgie had finally given up the chase and returned to her cage early on Thursday morning while he was getting ready for work. Mrs Appleby, a nursery nurse, said: "When Derek checked her caged and found her, we were so relieved and immediately called Heather, who had loaned Fudgie to us, to let her know the good news. "We had been told by the SSPCA to stop dropping food down the hole for Fudgie on Monday and so finally she had come up one of our make-shift ladders. 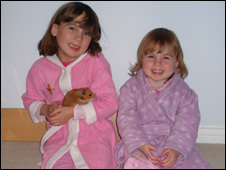 "It has been a nightmare because the children have been devastated and we have been up until the early hours each night listening for Fudgie because hamsters become more active at night. "I have been so upset and worried for this little pet and Zoe, who is a very sensitive little girl, has been heartbroken and really sobbing about it." She added: "We are over the moon that Fudgie has finally returned." On Monday two fire crews used a chocolate-covered camera and a vacuum cleaner to try to locate missing Fudgie. Fire crews spent five hours trying to recover the pet, which remained in its hole. Fudgie will be returned to her owners on Friday.